"Before you let the sun in, mind it wipes its shoes". 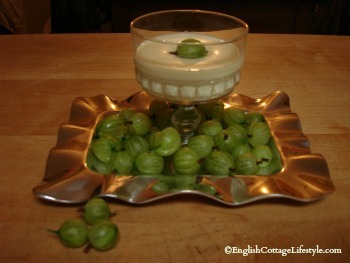 Recipe Of The Month: "Gooseberry Fool." It has been a rather soggy summer here in England with the clouds rather reluctant to budge out the way; the quote of the month sums it up perfectly! There have been a few delightful days of sunshine I was lucky enough to travel to Dartmoor during a four day heat wave you can read about my trip in this e-zine; I will be introducing you to an idyllic village called Buckland-in-the-Moor (see photo of the month) its on the way to the larger village of Widecombe-in-the-Moor. I also visited Exeter, the capital of Devon, on another four day heat wave which I will be adding to the Devon section because it is a fantastic City full of historical buildings. Exeter was once a “historical City” but lost the title after a large amount of historical buildings were lost to bombing during the second World War but there is still plenty of old buildings to see with lots of parks, water and trees just to add to its beauty. With the train station and excellent links from London, it is a great hub to discover Devon. With all this talk of Historical buildings I thought I would start from the beginning with the story of the English cottage. It’s origins lie in Medieval houses, just like the roots of the cottage garden belong in the Medieval garden (see last issue). If you are travelling in England why not visit a Medieval house open to the public to see for yourself the bond that will forever link these buildings to the cottage. You may find inspiration for your own cottage, décor or garden. Medieval houses are a reflection of how a person lived, most of England’s historical documents show records of the aristocracy or wealthy there is little record of the rest of the populations housing, it is around the late middle ages when England’s first great era in house building began. From here on we know that houses, however humble, would take inspiration from the homes of the wealthier aristocracy and gentry who could afford the finest craftsmen and materials. It was during the later Middle Ages, when society broadened , largely by improved trade both home and abroad, that merchant Yeoman and craftsmen were able to build smaller cottages and farmhouses that would last for generations. With trade came travel, and many records are left by travel writers of that time it is from these stories and the buildings that have survived that we have a record of how people lived. The building materials used in Medieval buildings would have been found locally using the local style of building tradition passed down from father to son, mason to mason. This is the meaning of vernacular buildings. The main material would have been stone, timber, brick, cob and plaster, with roofing of slate, thatch, or shingles, many other local materials could have also been used; flint, river stones or pebbles etc. Most stone churches and the great cathedrals look like they are made entirely of stone but hidden inside are enormous amounts of timber used to support the stonework during construction. Hundreds of trees could have been felled to make one great cathedral, back then England was mainly forest land and timber was a readily available resource. All this timber has given historians clues to the ages of buildings through the study of Dendrochronology; the analysis of tree rings; a tree trunk or branch will gain a new ring with each year of growth. Medieval Décor and Medieval Furniture. Medieval houses may look quite dark and gloomy to us now but back then lavish furnishing would have been used. Brightly coloured tapestries would have hung from the walls, sumptuous fabrics from around the world would have shown wealth and prestige and your place in life. Colour and texture represented money when it came to fabric and décor. The wealthier homes would have been decorated with mouldings, painted glass, tiles, fireplaces and even outside would be colourful with banners bellowing in the breeze the roof and corbels may have been painted a bright colour too. You can also tell the importance of a room by how lavishly it has been furnished. The family coat of arms would be out on display, brightly decorated. Not much furniture has survived six centuries this is because of time and because they needed to be able to dissemble them when they travelled around the country, making them wear out quickly. Even the windows could be removed from the building and put onto another home. The furnishings were of a simple design that could be adorned with whatever fabrics were in vogue and reflected their position in society. The other element of colour that will be missing when you visit an old Medieval house is the bright clothes of the gentry and their staff. Next time you visit one imagine everyone wearing ornate outfits decorated with embroidery and bright with colour. Colour was a reflection of the position you had in a large home and society, the better the job the more lavish your uniform was. Medieval houses were not so dull and gloomy once all the bright paint, tiles, glass, tapestries, wall hangings, banners, fabrics and clothing are a part of the picture. The origins of English cottage decorating come from the simple wooden furnishings and fabrics that adorned the homes of the wealthy in the late Middle Ages. It goes without saying that cottage decorating came much later, the cottager of the Middle Ages was more concerned with basic survival than decorating, I wonder if they ever dreamed of such a thing. The furniture and fabrics of Medieval houses may have ended up in many cottages later on, when the land owner became better off he built a bigger house for himself with newer furnishings reflecting the fashion of the day and his new standing in society. The “unfashionable” furniture would have gone to the cottage or farmhouse on the estate where, maybe, a family member lived. If you want to add a little Medieval colour to your cottage décor look for different fabrics of luxurious texture to drape over plain wooden furniture. Red and gold were very popular colours as were green, blue and yellow. Sometimes a splash of bright colour may be all you need to bring a room together. Photo: The Cherub Inn in Dartmouth, Devon. 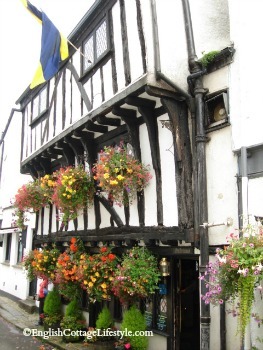 Over 600 years old the Cherub was once a Merchant's house. It is a Grade 2 star listed building that you can have lunch in! stop in next time you are in Dartmouth and have a drink and a look around. “Medieval Houses” by by Anthony Emery. It’s a ‘Shire book’ (they have excellent books on English history) small enough to put in your pocket if you need it when you visit a Mediaeval House. On a tiny winding country road flanked by overflowing hedgerows, a small village appears and the hedgerows give way to open countryside, cottages gardens and old stone cottages draped with a blanket of thatch. The water bubbles gently through the village, it is here that the cottage lover will think they have arrived in paradise. This tiny village is home to a few of England’s most photographed cottages. 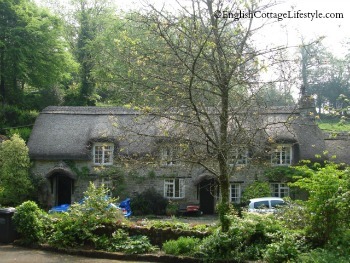 Beautiful Buckland-in-the-Moor is a “Chocolate Box Village”. Top and tail the gooseberries. Melt the butter in a sauce pan. Add the gooseberries (or rhubarb) and the sugar to the melted butter. (Add the elderflower cordial) Put a lid on the pan and slow cook for about ½ an hour. It is ready when the fruit is mushy. Remove from heat and with a wooden spoon beat to a pulp. Put the mix through a sieve and discard the pulp and seeds. Taste to make sure it is not too tart, add a little more sugar if needed. Set aside to cool completely. Whip the cream and then gently fold into the cool gooseberry mix. Serve in small pots or one large dish. Put in the fridge to cool for at least an hour. Garnish with elderflower or gooseberries and serve.